Over 1,000 athletes showed up Saturday, September 17th, 2011 for the Hy-Vee Ironkids National Championships in West Des Moines, IA. 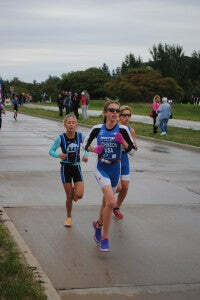 A cold front turned the triathlon championships into a duathlon. The traditional 300 yard swim portion of the triathlon was substituted with a 1200 meter run in the senior division. 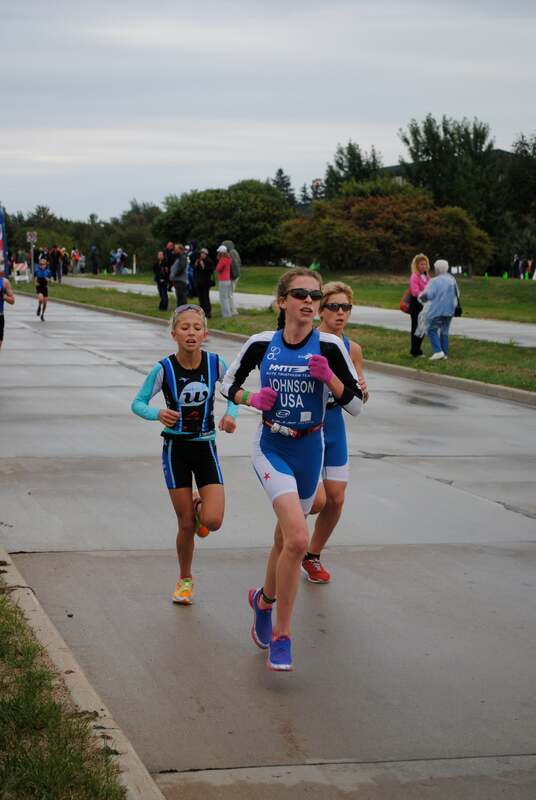 Winter Vinecki, age 12, (racing age 13 y/o female division based on USAT age-up rules) was able to strategically adjust her race strategy to help her achieve her second consecutive IronKids National Championship Title. Winter used the opening 1200 yard run to quickly open up an early lead coming into the first transition. Though the rain held off during the race, an early morning rain shower just minutes before the start was enough to create hazardous conditions on the bike course. Turns proved to be extremely slippery, as many riders lost control and fell off their bikes. Despite a slick road surface, Winter was able to maintain an 18.7 mph average on the bike, which turned out to be the fastest bike split in her age division and the second fastest female bike split of the day. Heading out onto the two mile run course, Winter followed tightly behind her main rival, Gina Johnson, matching her stride-for-stride. 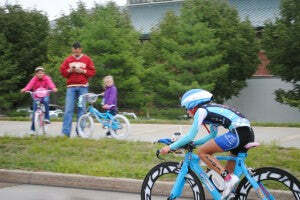 A time-trial start gave Winter a 12-second advantage despite being a few steps behind her friend and fellow competitor. Fighting side cramps half-way through the race, Winter summoned her inner strength, reflecting on the fact that no pain she was encountering could match that of which her dad endured during his losing battle with prostate cancer. The cramps subsided and it was a sprint to the finish. Gina tried to open the gap with 100 yards to go but Winter quickly responded with the speed and determination she has shown all season. Winter narrowed the gap enough to take an 8-second victory over Johnson and secure a repeat performance as the 2011 Ironkids National Champion. Winter continues to defy the odds season after season. In the days leading into most races, while other athletes are resting and off their feet, Winter undertakes a grueling schedule. Her coaches beg her to sleep-in, stay off of her feet, rest and hydrate 24 hours before competition. However, with her job as Ironkids Ambassador and her duty to Team Winter, such luxuries are often not fathomable. Speaking at schools before and after Ironkids events, she delivers inspirational and motivational talks to kids, preaching about the benefits of leading a healthy, active and positive lifestyle. The day before races, Winter speaks at pre-race meetings and works at the Team Winter expo tent. Though busier than most athletes could possibly imagine, she never turns down an opportunity to talk to a young athlete, sign an autograph, give race tips or pose for a photograph. For Winter, defending her championship runs much deeper than the simply joy of victory. With an inner drive fueled by her goal of finding a cure for cancer, she relishes in the fact that with each large-scale victory, her message becomes that much louder. 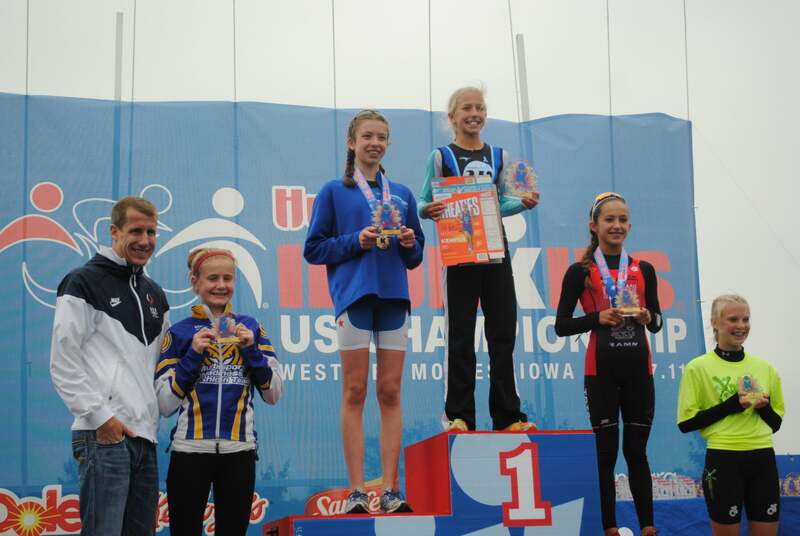 For every victory she receives, her first place IronKids trophy is given to a family affected by prostate cancer. Last year’s National Championship trophy does not sit on the family mantel. It is in the hands of Michael Milken; a prostate cancer survivor and founder of the Prostate Cancer Foundation. Since the founding of Team Winter in 2008, Winter and her Team Winter athletes have helped raise over $300,000 for prostate cancer awareness and research. She will proudly distribute all eight of her first place IronKids trophies from the 2011 season, including her National Champion trophy, to various families; reminding them that someone is out there fighting for them to ensure that one day, people will no longer have to suffer from this all-too-common affliction. As a means of raising awareness for prostate cancer on a global scale, Winter will be launching a world marathon tour. Beginning in the Spring of 2012, she will be running a marathon in every continent over the next two years in the hopes of raising funds and furthering the awareness of prostate cancer in areas she has yet to traverse. For more information on Winter, her goals, future projects, or to contact Winter herself, visit teamwinter.org. Follow Winter on Facebook (Team Winter and Winter Vinecki) and on Twitter @teamwinter.